Yasid Oozeear is the founder of YasidDESIGN, an automotive design company based in London, England. During the last two years, he has made himself known to the car community by publishing crazy renderings of modified cars that have become an inspiration to many. Watching his live sessions, we saw many questions that we also asked ourselves, so we were determined to have them answered. Yasid really is one of the nicest guys that we came to know and though he is very busy thanks to his growing popularity, he took the time to answer our questions. Q: Yasid, how did you come to develop your love for cars? A: My love for cars started from my very early age. I did not have a lot of influential car people around me, but I was always after my parents to buy me some toy cars. Of course. This passion started with Matchbox cars, and Hot Wheels later on. I am pretty sure that many of you can relate. I know a lot of car guys who started this passion in a pretty much same way. When I had these, I spent long hours trying to understand each of them (or most), looking at the design and wondering how it'd be if it was different. I was of course ruining a lot of them, the least favourite ones, with permanent markers, painting them, the wheels - just to get a bit of difference. Then obviously a couple years later this curiosity developed into a passion, this is when I picked up my crayons and papers. The one thing that was always coming to mind when I was asked to draw something was cars, sometimes trying to replicate my toy cars on paper (and failing miserably), and some other times trying to do something from scratch. Q: You originally come from Mauritius which most of us only know as a holiday destination. What is the car scene like on the Island State? A: Mauritius is a lovely, beautiful, incredible place to be -such ways to describe it can be endless- but the car culture there is quite limited. There are very few expensive cars, a few supercars and no hypercars at all. I wanted to bring some change but it was pretty much impossible being completely at the bottom at the ladder for a while. Travelling frequently for the sake of cars was also not the most practical thing to do as Mauritius is quite far away, isolated, next to Madagascar. Just like you said it's the perfect place for the perfect holiday! But because of the lack of the proper car culture I was looking for, I resorted to finding it online, in magazines and with the very few people who actually were doing it the way I like it. While I explored online for years and connected with people, I came to realize that what I needed to do was out there, outside of Mauritius. I preferably wanted to move to Europe for the vast cultures, spread in different countries and yet very close to each other. Q: What were the steps you took to become a car designer? A: Simple steps to be honest. I had the goal of becoming a car designer at a very early age. But despite the lack of money back then, I decided to do it all by myself using the one tool that made it all happen: Internet. I stayed up late every night learning new things. Like one of my mentors is always saying: "be a sponge! Learn everything you can!" I am going to be 30 in a couple of months, and since the age of 18 I have learned a lot by myself and I do not regret not having attended the school of design I was dreaming about. I believed that it could be done, and I did it. Of course, this works for me as I am not looking for an internship in any company, nor I am looking forward to work for someone or a company. I now have my own company running, soon with some spots for interns, hopefully. Q: Is there a definite process you go through when you create a new design ? A: Various steps really. I often mention it during my recent live sessions, that design is not just opening photoshop and doing a render. Many people these days seems to be very confused, or misled about what design really is. Design in itself is a whole pack of processes. Let's take a Car's design process briefly. Let's say that you need to design a car for a client and you're on your own. You will have your client with you while going through the very first stages. The very first stages are research, brainstorming, sketching the ideas you have in mind, communicating it to your client. Or perhaps putting his/her ideas on paper. A few, very commonly used stages at YasidDESIGN are research, brainstorming, thumbnail sketches, better and bigger scale sketches to show more details, renders (whatever kind the client wants), blueprints for 3D models and fabrication. I have been thinking for a while to include clay modelling for presentation but this is something that will come much later as it's not entirely needed by our clients at the moment. Of course, the design process differs from one to another. Creating a new car from the ground up, and modifying a car are two different process. One thing I'd like to mention is what I usually put out on our social media. Many of these designs are ideas that I have in mind, and wish to share. We rarely share clients' works. Q: Who is your favourite car maker/designer? A: My favorite car maker is without any doubt Horacio Pagani. For perhaps a million of reasons. This man is someone I look up to day and night when I am looking at my own thing going on. He does his work -and his cars- "like a boss". I love the way Horacio pays attention to every single detail like no one else. Right, I know that this sounds like I am "fanboying".. but.. Alright, I am! I do like the way Christian Von Koenigsegg does his marvelous job as well. Q: If you were asked to pick a favourite car, what would you choose? A: Asking me to pick a favourite car would be like asking me to pick one of my children. I don't have any yet, children I mean. It's very difficult for me to tell you which one is my favourite car out there. But I do have a thing for the Ferrari F355. I had the thought about buying one several times but it's very bittersweet. I know that if I do, it'll be as an investment and I'll have to sell it one day and I am not sure how this will go! As a daily driver, I am thinking about an R8 first gen -I really love this car- as the value is quite interesting these days but none of these are on my priority list as I have YasidDESIGN on the table at the moment. 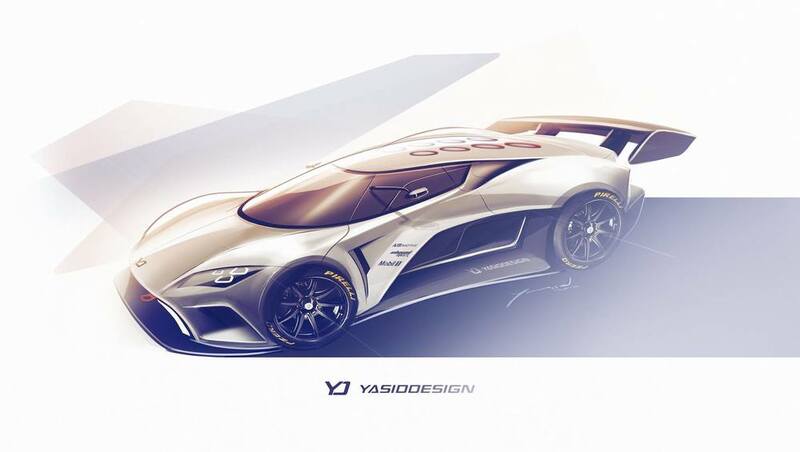 Q: YasidDESIGN officially exist since last year, what were the first designs / projects you took on as an independent automotive designer? A: YasidDESIGN started last year as a car design consultancy company. As you know, we were offering people to visualise their cars as they want it to be, before they take it to their fabricators to make their dreams come true. But we gave them the opportunity to see the design before it was made, and do any changes that were needed. We have since worked with many individuals wanting to design their dreams. However our biggest projects are the ones involved with some companies. Sometimes for specific brands (on going projects, which I hope we'll be able to share soon!) and this is seen as collaboration works. One thing I am looking forward to in the very, very near future is a series of projects along-side one of London's best known tuning/bodyshop. We have build a few designs together in the past including a one-off Mitsubishi FTO Ute, a completely custom Nissan R32 Skyline GT-R and for now, we have a unique, fully carbon GTR in the works. Fingers crossed! We have been planning on doing some bigger things together soon, so watch out! Q: What "serious" project to date did you enjoy working on the most ? A: If I'm honest, I am not able to pick a most favorable project, or a most serious one. We tend to take everything very seriously. By that I mean that we had a lot of serious ones going on from time to time. Q: You also create a lot of studies / renders that you publish on your facebook page. What are your all time favourites to this date? Like I mentioned a few times I am using facebook and different social media platform to communicate my favourite ideas with people. Q: You worked with Jon Olsson on an awesome April first prank. Can we expect a real project from this fun collaboration? A: The collaboration work with Jon Olsson is definitely a fun one, if not the most fun. We started collaborating on this project way before April and it's still an ongoing thing, although at the moment it's on hold. We did think about doing a "Mutant" Inbound Racer with a Huracan to fool people on April 1st and I guess it did work flawlessly. Jon Olsson said: "Now we'll have to do something as crazy". He is a very busy man and the project is on hold for the moment so keep your fingers crossed as I am sure that he'll be back in force as soon as he's ready and we'll do our best not to disappoint. Q: What project do you have on the table at the moment? It's not very easy to disclose many of our client's project but I can disclose mine. I am working on a brand. I do not want to give away too much for now, but with a very busy schedule these days, I am hoping to be able to share more, soon. Q: Recently, you've been on the search for 3D Modellers. What do you envision for the future of YasidDESIGN? This is going to be mainly for the various projects we have on the table, but mainly for the brand we're working on. Let's put it this way: I see YasidDESIGN as a mother base in the future with a serious brand attached to it. I mentioned several times before, that my ultimate goal is to have my own car built. So I want to give this a go. If I fail at first, I guess I should try again. That will be a good way to revise my childhood madness, breaking bikes to build karts! It was fun but also dangerous and my kart got seized. For news about YasidDESIGN and the live sessions Yasid makes on a near daily basis, visit their Facebook page. Do also check out his youtube channel for timelapses of other designs. And should you feel like having a design made for you, visit Yasid's Shop!